Nearly a dozen residents who support keeping OB’s fire rings showed up at the Town Council’s regular meeting, Wednesday night, April 28th, and about half of them spoke up at the Masonic Temple meet before the very attentive Council on maintaining the community’s icons. And even though the Town Council did not take a vote during the meeting, those members of the Council who spoke on the issue gave strong indications the Council would vote during their next meeting in support of the fire rings. About two years, the Council passed a similar proposal in support of the pits. After hearing numerous reports from various political offices and agencies, OBTC president Jim Musgrove turned the meeting over to the fire pit issue. Frank Gormlie spoke at length about the need to keep the rings, citing cultural and recreational reasons, the effects on the tourist trade, the fact that the City allows volunteers to do work in a whole variety of sites and positions. It wasn’t just OBceans that used the rings, he said, but they are used by people from Point Loma, Santee and tourists visiting from all over. He also described the requirement by the Coastal Commission for permits to remove recreational facilities- which the City does not currently have, plus he explained that without the rings, “people will still build fires at the beach,” which would in turn create dangers for people walking on buried but hot coals left from those fires. Gormlie called on the OBTC to work with Councilman Faulconer’s office and other non-profits in the community in an effort to fund the fire pits. Following Gormlie – who was warmly received by the Council and audience – several spoke in favor of the fire rings: Dan Morales, Sunshine, Shane Finneran, Cristy, a couple of guys in the crowd, and Dave Martin and Landry Watson of the Board. Speakers brought up the fact that adopt-a-highway volunteers are allowed, that international visitors use the fire rings, that the safety issue was real as a relative of the speaker had actually burned his feet walking on buried coals and still has the scars, and that perhaps some funding for them could be had from fees collected for other beach uses like volley ball, as well from local hotels. Martin of the Council stated that “all the current fire pits on the beach (in OB) were bought by the Ocean Beach Town Council,” explaining that the earlier rings had been destroyed. Watson cautioned that OB should work with the Council office and agencies before rushing into taking matters into our own hands. “OB will take care of OB if it is necessitated, but let’s not rush into that,” he said. During some Q and A, SDPD Community Relations Officer Dave Surwilo stated that he didn’t think his officers had the staff to patrol for illegal fires on the beach. He also said that he thought that having grills at the beach was also illegal (editor: I think he is wrong on this related issue). This blog has taken a leading role in keeping the issue of the removal of OB’s eight fire rings alive. Many of those who spoke up in favor of them are supporters or members of the staff of the OB Rag. 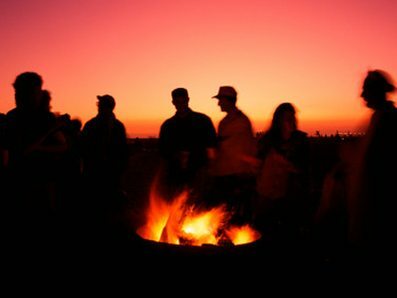 It is this blog’s “Adopt-a-fire-pit” program that has captured the attention of media, as even the New York Times has covered these efforts. The Adopt-a-fire-pit plan is still active, but many folks involved in the issue realize that it will be difficult for the City to deal with them on a piece-meal basis and ultimately all 185 of San Diego’s fire rings must be saved. Without funding or without a change in plans, the City plans to begin removing them July first this year. As the funding cycle is currently in play, the next few weeks are crucial for the fire rings. Local OB activists are thinking of having a rally in support of saving them, so keep an eye out for further news. Here’s a link to NBC San Diego’s coverage here. The OBTC doesn’t take votes during their public meetings. They reserve any for their non-public meetings. But like I said in the post, all indications are that we were speaking to the choir during the meeting about the fire rings. I was on KOGO radio yesterday talking about the fire rings for about a half hour, along with Hans Baumgartner of Save San Diego Fire Pits and Phyllis Pfeiffer from La Jolla. The show will air on KOGO AM 600 on this Sunday at 12:30pm. Check it out.